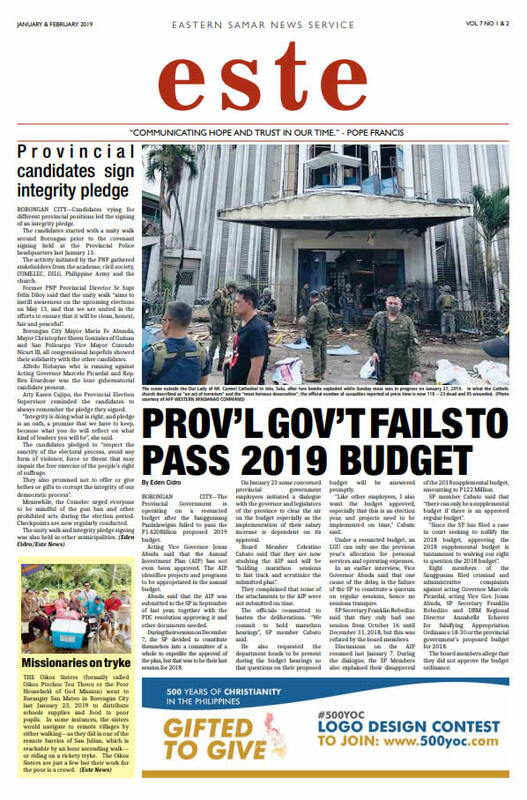 BORONGAN CITY, January 23, 2019—THE Provincial Government is operating on a reenacted budget after the Sangguniang Panlalawigan failed to pass the P1.420Billion proposed 2019 budget. 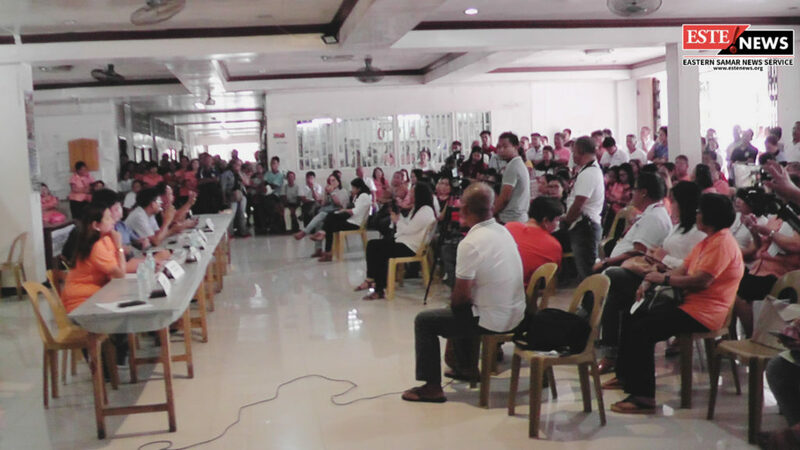 Acting Vice Governor Jonas Abuda said that the Annual Investment Plan (AIP) has not even been approved. The AIP identifies projects and programs to be appropriated in the annual budget. Abuda said that the AIP was submitted to the SP in September of last year, together with the PDC resolution approving it and other documents needed. During their session on December 7, the SP decided to constitute themselves into a committee of a whole to expedite the approval of the plan, but that was to be their last session for 2018. On January 23 some concerned provincial government employees initiated a dialogue with the governor and legislators of the province to clear the air on the budget especially as the implementation of their salary increase is dependent on its approval. Board Member Celestino Cabato said that they are now studying the AIP and will be “holding marathon sessions to fast track and scrutinize the submitted plan”. They complained that some of the attachments to the AIP were not submitted on time. The officials committed to hasten the deliberations. “We commit to hold marathon hearings”, SP member Cabato said. He also requested the department heads to be present during the budget hearings so that questions on their proposed budget will be answered promptly. “Like other employees, I also want the budget approved, especially that this is an election year, and projects need to be implemented on time,” Cabato said. Under a reenacted budget, an LGU can only use the previous year’s allocation for personal services and operating expenses. In an earlier interview, Vice Governor Abuda said that one cause of the delay, is the failure of the SP to constitute a quorum on regular sessions, hence no sessions transpire. SP Secretary Franklin Robedizo said that they only had one session from October 16 until December 31, 2018, but this was refuted by the board members. Discussions on the AIP resumed last January 7. During the dialogue, the SP Members also explained their disapproval of the 2018 supplemental budget, amounting to P122 Million. SP member Cabato said that “there can only be a supplemental budget if there is an approved regular budget”. “Since the SP has filed a case in court seeking to nullify the 2018 budget, approving the 2018 supplemental budget is tantamount to waiving our right to question the 2018 budget”. Eight members of the Sanggunian filed criminal and administrative complaints against acting Governor Marcelo Picardal, acting Vice Gov. Jonas Abuda, SP Secretary Franklin Robedizo and DBM Regional Director Annabelle Echavez for falsifying Appropriation Ordinance 18-30 or the provincial government’s proposed budget for 2018.